It is the time of the year when you see oranges everywhere you go. Farmers markets are flooded with different varieties of them. Every year I make a big batch of marmalade and store them for the rest of the year. 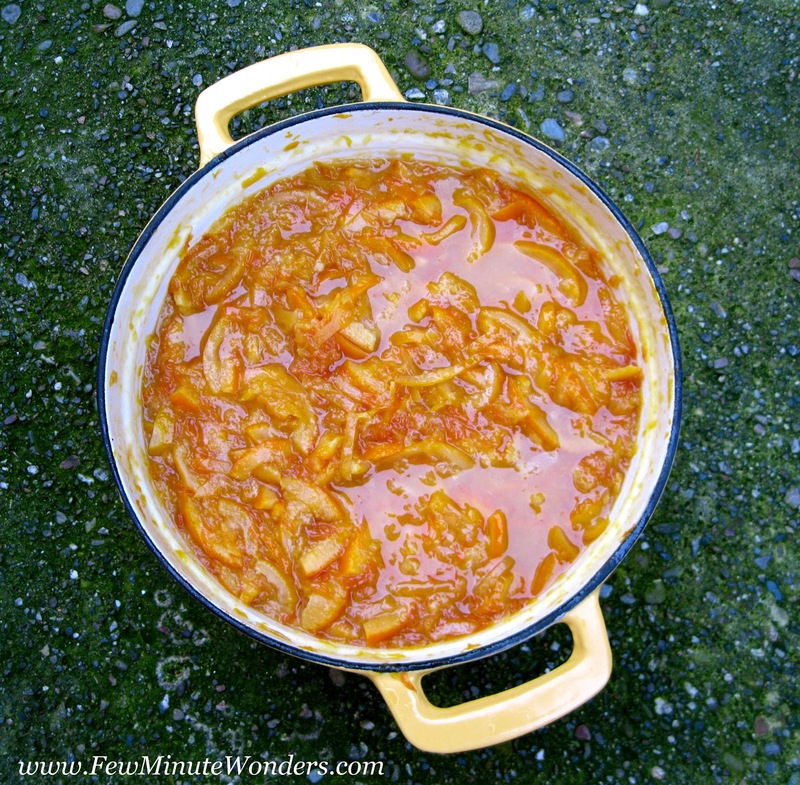 This year I made marmalade with 3 different types of citrus fruits ( grape fruit, lemons and oranges). It was an interesting combination I must add, leaves a light bitter taste at the end. I was surprised that it was gone by the end of the week. I did share with family but, everyone seemed to enjoy it. So, I had to make another batch. At the farmer's market, I have the regular guys I buy my produce from. Last week, I was given a very heavy grape fruit which was personally picked by the farmer. "Senorita" he said," this one will be good in the jam you are going to make". I thanked him and paid his 2 $ for the huge organic grape fruit and came home to make the marmalade. 1. Thinly slice the lemons and oranges and make sure to collect the seeds and keep them aside. 2. Remove the skin of the grape fruit, making sure to avoid the pith as much as possible. 3. 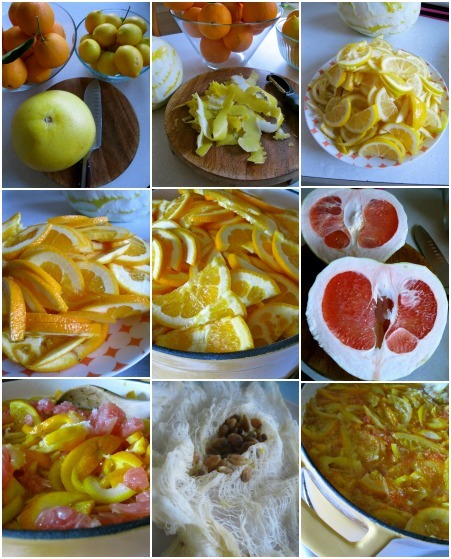 Thinly shred the grape fruit peal and add them into the stock pot alone with the sliced lemons and oranges. 4. 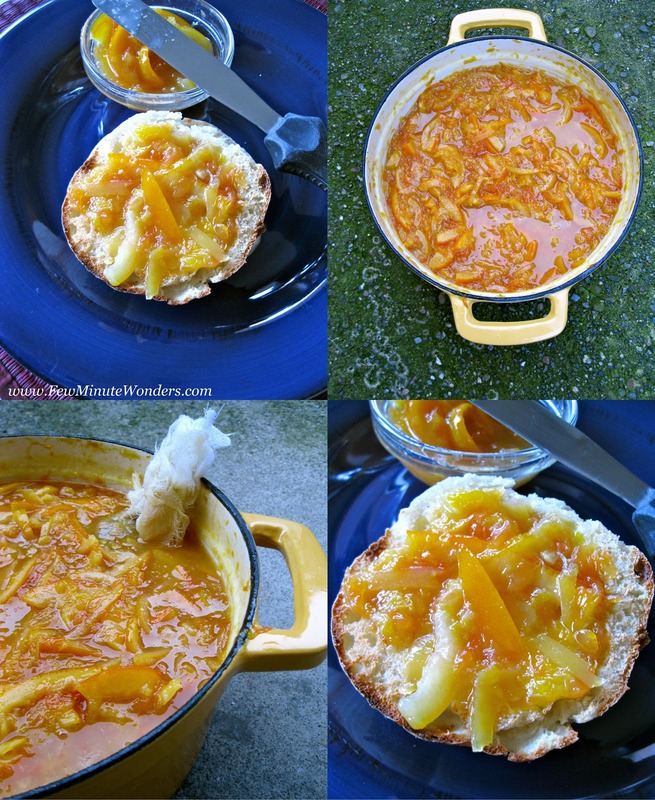 Cut the grape fruit open and slice off the thick pith, remove the skin from the slices and add them to the stock pot. 5. In small piece of cheese cloth add all the seeds, make a bundle and toss it into the pot. 6. Add 2 cups of water and bring them to boil. 7. Add both the sugar and allow for the sugar to melt and the citrus fruits to get cook for about 30 minutes on medium high. 8. Remove from heat and allow to cool. Cover and allow to rest for 12 hrs or over night. 9. Reheat the pot and allow for it to cook on medium heat for an hour an a half. 10. Allow it to cool and store in sterilized bottles. Seriously send me a huge bottle full of this marmalade,i'll be very thankful for you..Droolingggg..
Marmalade looks tasty as there is a good combo of fruits.Neat presentation. Looks awesome, my favorite, love the tangy and sweet taste..